Toronto is one of the great cities of the world, a diverse metropolis with a rich history, progressive citizenship and, of course, beautiful street art. In fact, Toronto’s art scene has only grown with the city itself and people in almost every neighbourhood can point to beautiful, community-focused public art projects. In Kensington Market, the road is adorned with beautiful food graphics promoting the area’s food scene. In St. James Town, people can see the now-famous phoenix mural soaring on a prominent apartment building. And now, Leslieville has its very own mural that celebrates its past and looks towards its future. Unveiled in September, the mural is a depiction of Alexander Muir sitting under the Maple Leaf Forever tree, which was destroyed during a storm three years ago. Muir, a Toronto poet, educator, soldier and songwriter, was the first principal of the Leslieville Public school and grew up in the area. Appropriately enough, the tree under which he sits in the mural is named after his most famous song, “Maple Leaf Forever.” The mural was painted by local muralist and artist Elicser Elliot and can be seen at the corner of Queen Street East and Jones Avenue. The mural itself is actually covering up a mural that was created by a group of students twelve years ago. That mural, having since deteriorated and suffered vandalism, was in dire need of updating or repair. But, according to local copyright laws and regulations, the original creators were the only ones allowed to alter or restore the mural. Since their names have been scratched off or painted over, that became next to impossible. The old Leslieville mural – damage is clearly visible. Once a plan was in place, they secured grant funding from the city and mural designs started to pour in. Eventually, the selection process came down to just three artists: Dan Bergeron, Elicser Elliott, and Mediah. To make the final decision, local residents and business owners were invited to Project Gallery to decide on which mural they wanted. Elicser Elliott, often known more simply as ‘Elicser,’ had his design chosen and it was soon installed. Leslieville has a long and rich history with a number of famous people who have contributed to its identity and success. Now, it continues that tradition with its latest mural, all while contributing to Toronto’s blossoming and diverse art scene. Graffiti wording is one of the most recognizable aspects of street art. Highly stylized letters and words have become an intrinsic part of the street art and graffiti culture, so much so that learning to letter properly is often seen as an important stepping stone in any artist’s career. It’s a place where people can start to experiment with their own true style and many artists end up creating a definitive signature that is the result of everything they’ve learned about graffiti lettering, often very early on in their career. You can see it on most street art, in fact, a small but perfected signature of the artist on their piece. No matter where their work has gone, that small homage to the graffiti letter will always remain. But such widespread popularity has made graffiti lettering an often ignored or reviled aspect of the street art scene. Indeed, many people can list off examples of lettering that they would consider crude graffiti, not art, scrawled to announce graduating classes, love, or simply to write profanity in a certain way. It appears on bridges, in subways, and all over, and most people would prefer to ignore it. Enter Canadian street artist and graffiti lettering lover KWEST. The Toronto-based graffiti artist has mastered the art of lettering, as anyone in Canada’s largest city can attest. His beautiful and distinctive renditions appear all over the city, from Kensington Market to GO Station rails, and is some of the most accomplished work in the entire city. So when KWEST (pronounced “quest”) was invited to a European music festival that has a large dedication to art, he decided to take what he does best and make it so no one could ignore it. 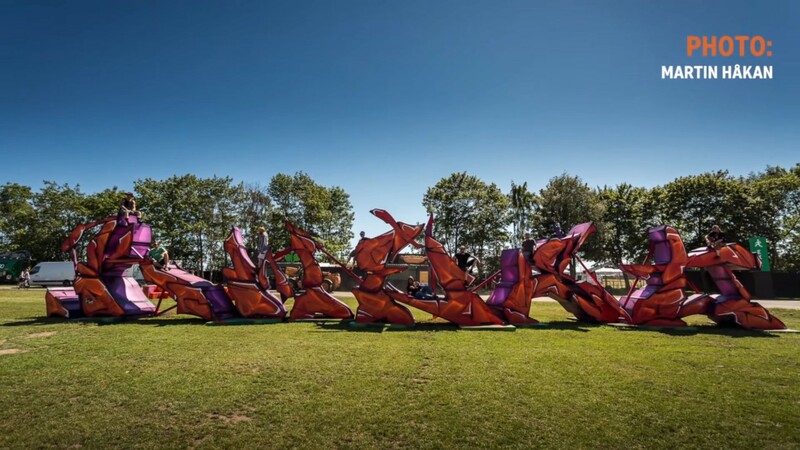 The result is his biggest project to date, a series of graffiti letters made from wood that looked like they were scrawled in Toronto, but were actually freestanding at the Roskilde Festival in Denmark. The process of putting together what has been called “the world’s biggest graffiti letter sculpture” started in a warehouse near the festival, where KWEST and his team were given hundreds and hundreds of pieces of wood to make the letters. Working together over the course of a few days before music lovers showed up to the festival, they carefully carved, cut, and sanded the pieces into the perfect shape. The entire process looked like the team was making an abstract skateboard park more than graffiti letters and it wasn’t until they were up and painted that the project began to take shape. KWEST does all of his graffiti writing free hand with spray cans and he wanted to give that style to the letters, but also give them considerable depth. So, with the help of some of his friends and co-artists, they decided on a colour palette that gave the pieces an even larger, more pronounced look. The result was a sculpture that commanded an audience, impossible to ignore and breathtaking in scope.